My students created poster advertisements for their Hero’s J0urney video game projects. 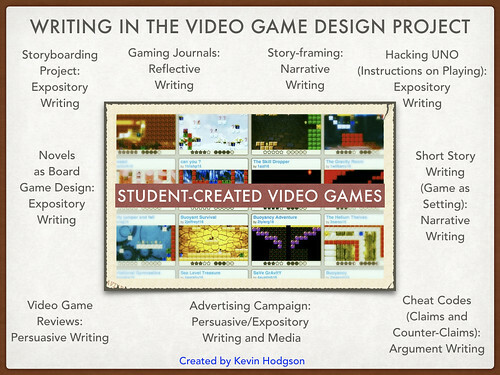 This allows us to think about visual elements of persuasion, deconstruct how we are targeted through advertising, and merge art and writing with game design. 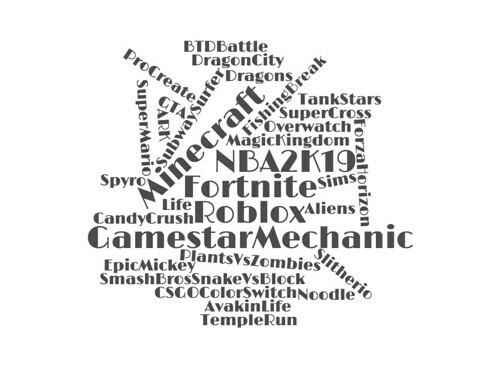 I work quite a bit of writing into our video game design unit, and one of the final pieces of writing is a letter all students write to the folks at Gamestar Mechanic, explaining what they have enjoyed about the platform and some advice for features they would like to see incorporated. We did some class brainstorming of ideas first, as a way to guide their thinking. 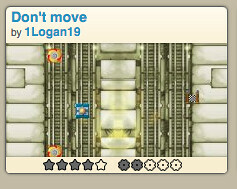 In my ELA class we are using your website on a project to create games. We are working with the Hero’s Journey theme. My game is called Journey To Treasure. My game has 5 levels. The first level is the character finding a map of a ship wreck and buried treasure. The second level is the character on the journey to find the treasure. The third level is when the character found the treasure in an underwater cave and they have to fight enemies to get the treasure and go home. The fourth level is the journey home and the fifth level is when they are home and can take a relaxing vacation. What I like about Gamestar is that there are multiple quests and you can play other peoples games. There is also a wide variety of games within the quests. Some advice for making Gamestar Mechanics a better game is adding a multiplayer mode so that you can invite your friends to join so you can play together. You should also add more music so that the sound effects and music in the game helps you get into character in the game. Another thing I think you should add is an update so that enemies can drop rewards like more health or a key. During class we have been working with your platform me and my fellow peers (our whole grade) have been assigned to create a game and do your quests. My partner Gabby and I had so much fun and were always looking forward to class. My game is about a wolf Sky and her journey to help a queen. Sky needs to fight all the king’s evil minions (the evil wolves and polar bears) and then the dragons. What I really like about Gamestar is that you have to earn lots of things you might need as an example earning the publishing rights. I absolutely love the variety and the creative freedom. In like every game platform there is some flaws. Lots of people and I agree that it should have auto-save during the process of making a game and all the time. I know some groups lost their games because of this. 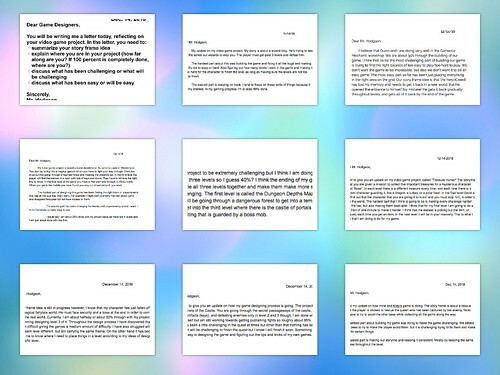 Another thing that should be ABSOLUTELY changed is the limit of words\text throughout the game I wasn’t able to type all of the messages I needed to making my game I was very upset to learn about this and so was my partner, my friends, and lots of other who had this issue. Otherwise I love the platform it is so fun and lots of people including me think the platform is great for kids and adults alike. In my class, we have been doing a project with Gamestar Mechanic. 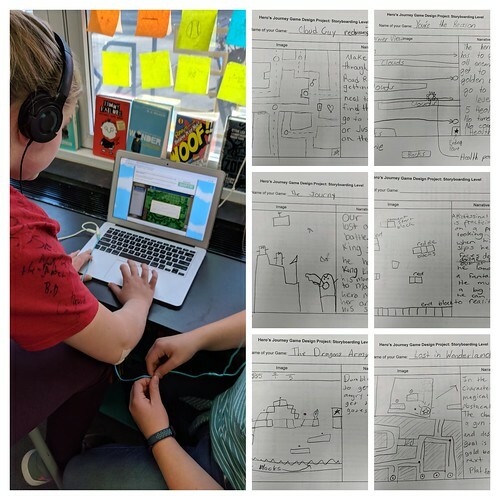 We have been making games and seeing how literature is incorporated into it.We were using the platform “The Hero’s Journey.” My game is called the Iron Fortress. It is about Ronin, a warrior, who has to find a magical sword and defeat the evil wizard Shakhar. Ronin travels through the Iron Fortress in his Quest to defeat Shakhar. I enjoyed many things about your gaming platform. One of the things I enjoyed was the simplicity. Nothing is too hard to understand and the controls are simple. I also enjoyed the Quests. I like the idea of playing to earn blocks, backgrounds, or sprites. One thing I think would improve Gamestar Mechanic is the ability to customize sprites and blocks. Even though you can customize backgrounds, I think it will take the game to a whole new level if you could customize sprites and blocks. You could make challenges that give you material to build your own sprites and blocks. You could put a section in the workshop that is purely for customizing. I am a student in Massachusetts learning about game design in ELA. We have been playing quest to learn about the Hero’s Journey concept of all video games. We have also been making a game of our own using the Hero’s Journey concept. There are many things I like about Gamestar Mechanic, here are a few. I like how you can play Quest to learn how to create a game of your own. (play to learn) It is also very easy to use, I can switch between workshop and quest very easily. 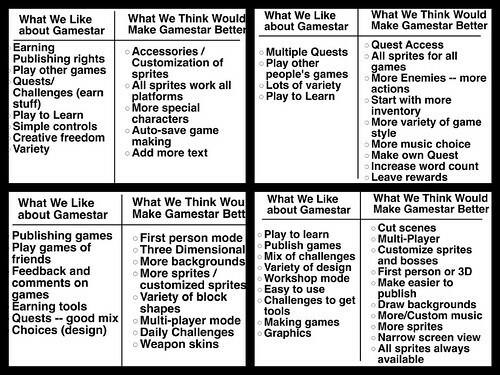 Even though there are many things I like about Gamestar, there are a few things you could work on. I think first person would be a great concept of this game. I think there should be more sprites and avatars to choose from. Finally, I think there should be more music, and I should be able to customize it. Thank You for reading. I’ll be shipping these off to the Gamestar Mechanic office, in hopes some developer receives them and reads some of the insights. 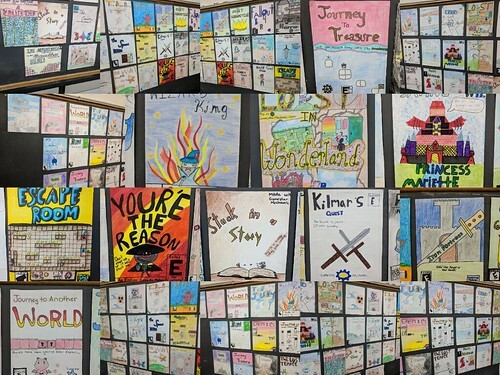 We’re in the midst of our Hero’s Journey video game design unit, in which my sixth graders are developing and then publishing a video game based on the concept of the Hero’s Journey. 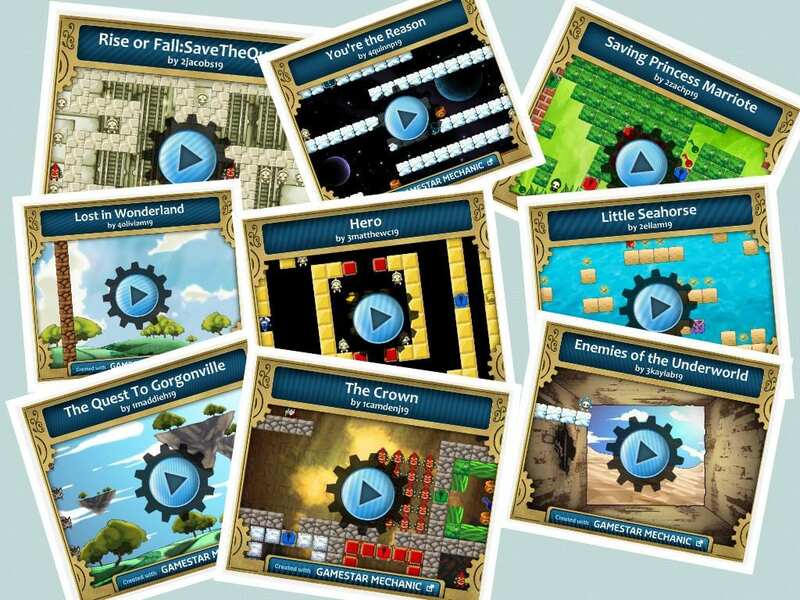 We use Gamestar Mechanic, which teaches students how to build games by playing games, and provides tools for publishing. The first phase is all about story-framing (what is the story that will be the backbone of the game) and storyboarding (what will your game look like) and this work provides some rich moments of questions and conversations and thinking through the game before it is under construction. I love the variety of games under consideration. I have traditional “make your way home” and “rescue mission” stories, as well as ones that are inspired by novels they are reading, and even this year, one in which the character is inside a “book” as the setting of the game. I’m looking forward to watching that one get developed. 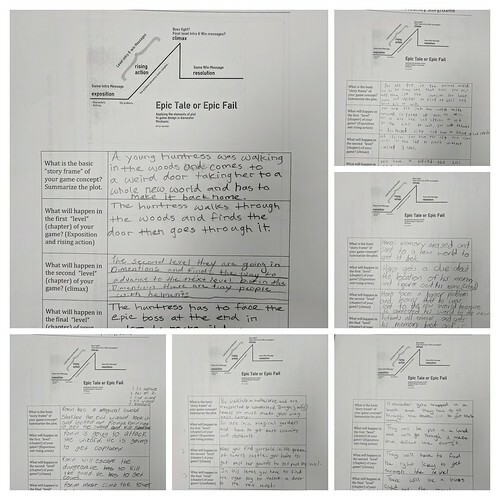 The story-framing is a way for young game designers to articulate the spine of the narrative, and they often require reminders during the building of games to refer back to the story-frame. Meanwhile, the storyboarding gives rise to questions of design, of where things might be and how things might look, and often prompts questions about what they can and cannot do in Gamestar Mechanic as designers. I do a lot of huddling around work-arounds and alternative ideas once they are deep into design. But this early work gives me a glimpse of what they are thinking, and provides them with a map from which to begin work.